The Kronosaurus Korner Museum is part of Australia’s Dinosaur Trail, a trail that includes 3 towns and tonnes of fossil exploration in outback Queensland. 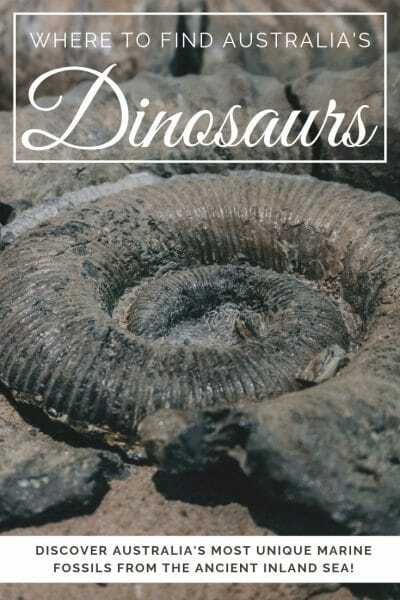 The Richmond Dinosaur Museum contains some of Australia’s most complete dinosaur remains and is possibly the most popular of the things to do in Richmond, Qld. It’s also part of the reason we chose to go inland to Darwin, instead of following the coast along the top and is undoubtedly worth the detour. In this post, we’ll show you why you need to visit the Kronosaurus Korner Museum, even if you’re not a huge fan of the prehistoric eras. This post may contain affiliate links. This means if you choose to make a purchase from a site we’ve linked to, we make a small commision at no extra cost to you. This helps support our website and keeps the content flowing, so thank you! Kronosaurus Korner is located in Richmond, a remote town in outback Queensland approx. 5 hours inland from Townsville. Surprisingly, you don’t have to have your own car to get to Richmond. The Greyhound buses run through here as does a railway service 2x a week. You can find out more transport options here. We did a self-drive visit and in all honesty, it’s the best way to experience the outback completely if that option is available to you. On the way to the Richmond Dinosaur Museum, don’t forget to check out Porcupine Gorge! A stunning ancient gorge that has been forming since before the age of dinosaurs. 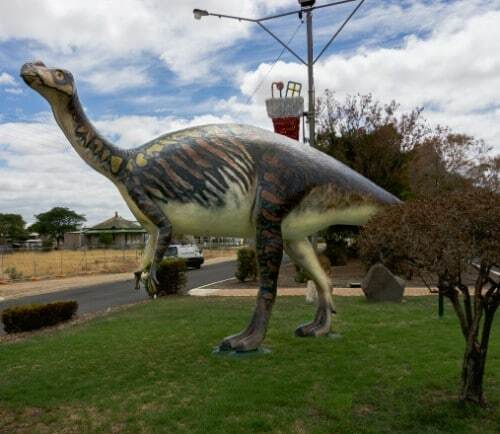 You’ll also pass through Hughenden which is also part of the Australian Dinosaur Trail. When you think of Australian creatures, you think of Kangaroo, Koala and all those deadly critters you see on TV. 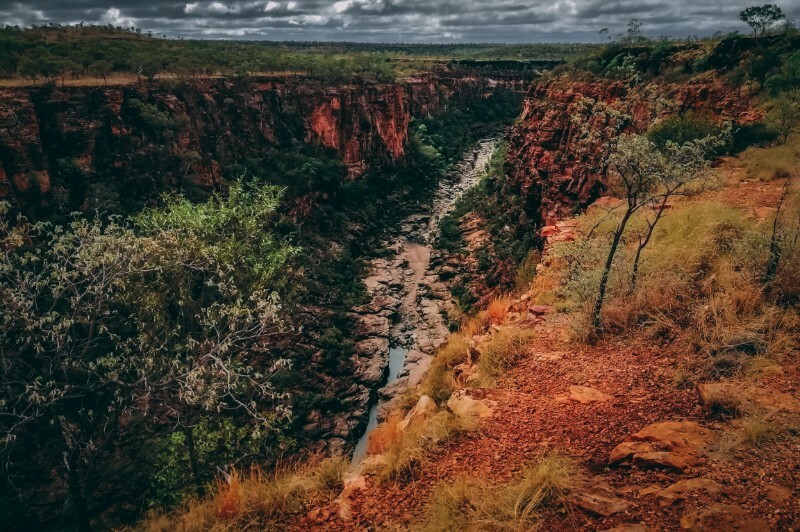 But did you know the Australian outback was once almost completely underwater! In prehistoric years, Australia had an inland sea, now knowns as the Eromanga Sea, that was home to some pretty unique marine reptiles, including the Kronosaurus. 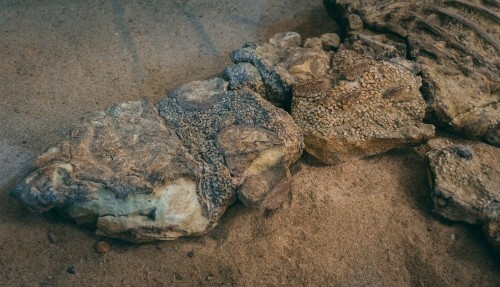 A lot of Australia’s Dinosaur and prehistoric remains have been found in outback Queensland; most notably Richmond, Winton and Hughenden which form the Australian Dino Trail. If you’re travelling the Outback can be unpredicatable, get organised with our outback packing list! 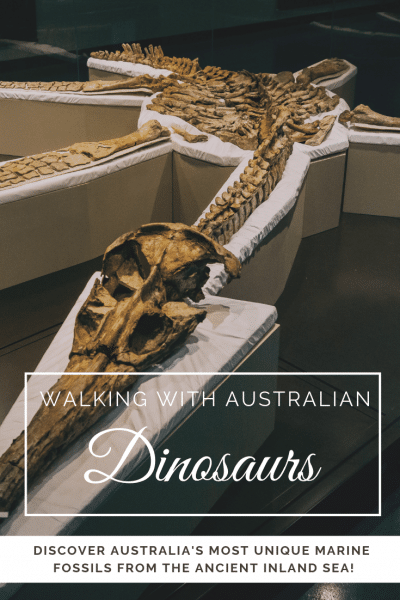 The Australia Dinosaur Trail covers the Kronosaurus Korner Museum in Richmond, Winton’s Dinosaur stampede (The world’s only record of a Dino stampede) and ‘Mutt’… the Muttaburrasaurus Dinosaur who lives in Hughenden. 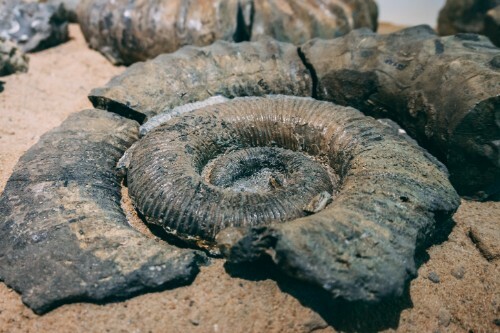 There’s also the chance to dig for your own fossils in Richmond as well as countless other fossil and Dinosaur museum scattered across all three towns. 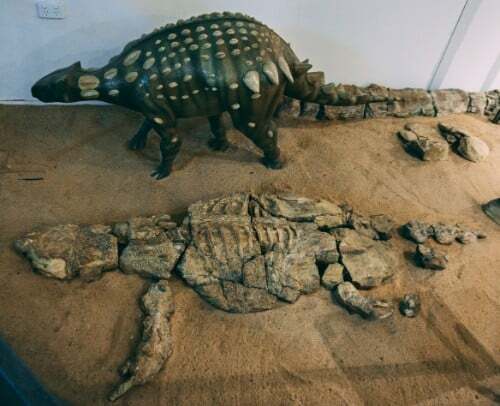 If you’re stuck for time, we’d suggest sticking to Hughenden and Richmond as these are pretty close together and you definitely don’t want to miss out on some of the unique specimen found in Richmond’s Dinosaur Museum. However, if you do have time to do all three you can buy a pass for every attraction on the Dino Trail that will save you money. You can find that here. 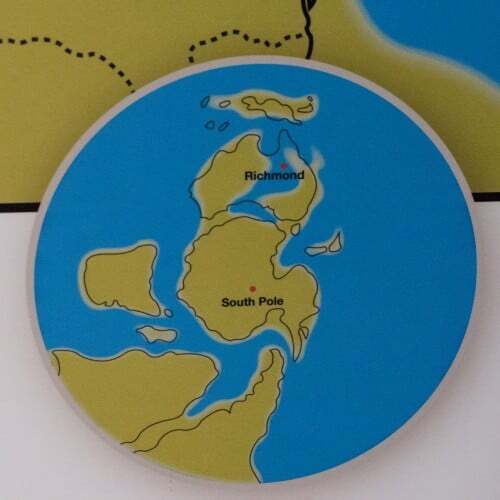 The world as it was in prehistoric times, showing Australia’s great inland sea. Arriving at Kronosaurus Korner we were greeted by reception and handed an audio stick. The museum is really well laid out and to allow guests to go at their own pace it is a completely self-guided experience. Each display has a different story, told to you via the audio stick. 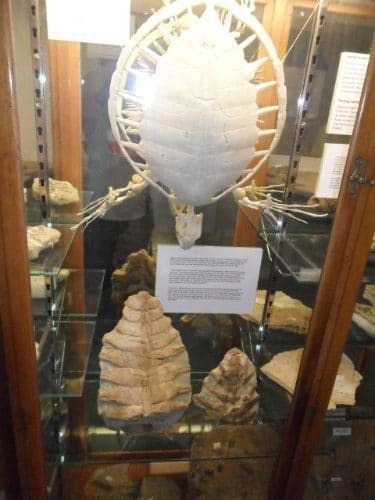 An important thing to know about this museum is that most of the specimen there have been found locally, and provide evidence of life in the ancient sea; a completely different world to what the residents of outback Queensland know now. 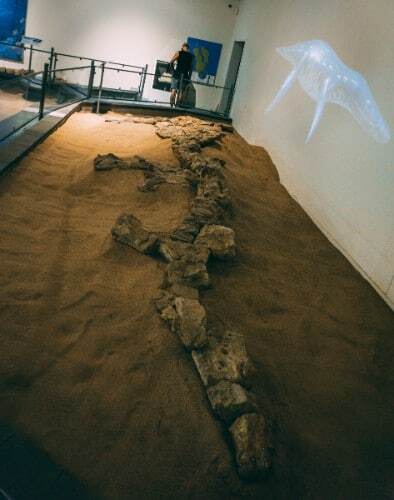 The first hall is dedicated to the Kronosaurus, Platypterygius and Eromangasaurus; giant marine reptiles whose remains have been found to be almost complete, including one with a foetus in its womb, making them some of the rarest and most impressive fossils in Australia. The audio stories go through the findings of these fossils along with how scientists believe they lived, what they ate, how they hunted etc. What I found most fascinating about the fossils and bones at Kronosaurus Korner Museum, however, wasn’t their size or their wholeness. It was how they were found. Most of what you’ll find in Richmond wasn’t buried deep, deep underground like you’d imagine and neither were they found by people who were actively looking for fossils in that area. They were found by pure coincidence and that, in my opinion, makes them even more unique. One of the nearly complete specimens at Kronosaurus Korner Museum. You expect to see incredible dinosaurs and marine fossils at Kronosaurus Korner museum, but 110 million-year-old Australian turtles? This was an amazing surprise. As with all the other specimen here, the Turtle fossils are almost complete too and you can see how modern-day turtles have hardly changed at all since the prehistoric era. My absolute favourite finding at the Richmond Dinosaur Museum was ‘Minmi’ the mummified Kunbarrasaurus. This dinosaur was found near Richmond in the ’80s and is one of the rarest kinds of fossils to be found across the world. Why? Because not only was it preserved so well that you can see it’s skin texture, scientists were also able to retrieve traces of its stomach contents meaning they have an incredible insight into accurate eating habits of this kind of dinosaur. Being able to see Dinosaur Skin really hit home that these were more than just a display, and if seeing ancient turtles wasn’t enough to force you to visit, Minmi surely would. How amazing is Minmi, the mummified dinosaur? Look closely, you can see Minmi’s skin! 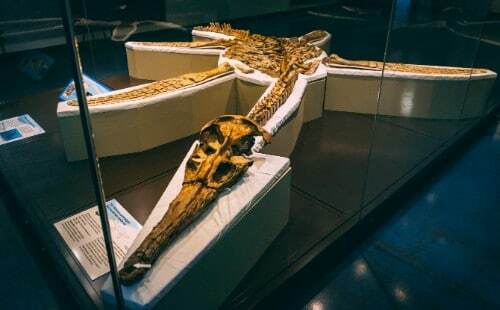 The most popular of the things to do in Richmond’s Dinosaur museum is admire Penny, a complete specimen of Plesiosaur found near Richmond by a local cattle owner. Penny is special in so many ways and at 4.25 meters she’s also one of the worlds largest of her kind. In the third and final room are more common fossils that you’ll be familiar with. Fish, Pterosaurs and Ammonioid make up some of the collection here but if you’re lucky, you might be able to see behind the scenes of Palaeontology via the window into one of the research labs. There was nobody about when we visited but new fossils that they were working on still remained on the tables. 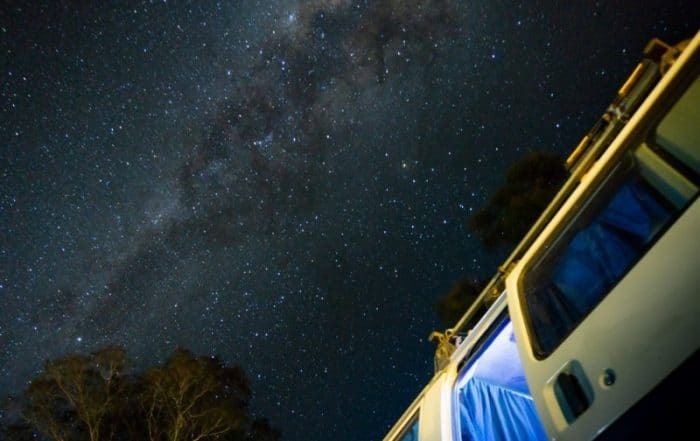 Other things to do in Richmond, Qld. Get your hands dirty and dig for your own fossils. Richmond Fossil Dig site is open to the public for a small fee of $5pp, this gives you access to the geological site for the entire day (if you want) and more often than not you’re allowed to keep what you find; unless it’s a breakthrough discovery, but then you get to say you found a dinosaur which is pretty cool anyway. A Kronosaurus Jaw, compared to the jaw of a modern-day crocodile. I’d love to say that this is a remnant of the Eromanga Sea but I can’t find any proof of that (how cool would that be!). 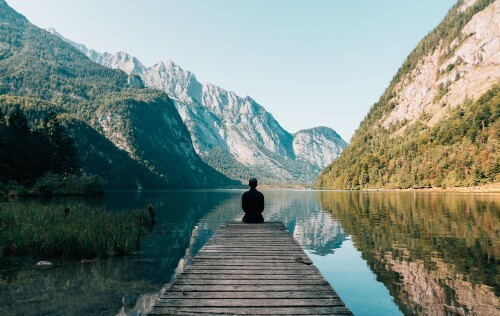 However, Fred Tritton Lake is a great place for water sports, fishing and just generally feeling a little less like you’re in the middle of nowhere. It’s completely free and there’s an impressive amount of fish life here, so if you’re a keen nature lover or fisherman don’t forget your rod/swim gear! You’ll find the Bush Tucker Gardens near Lake Fred Tritton and they’re great for finding Richmond’s birdlife and learning about the local plants. Again it’s completely free and there’s a peaceful picnic area to help you recoup before the rest of the journey. Want to be prepared for the outback? 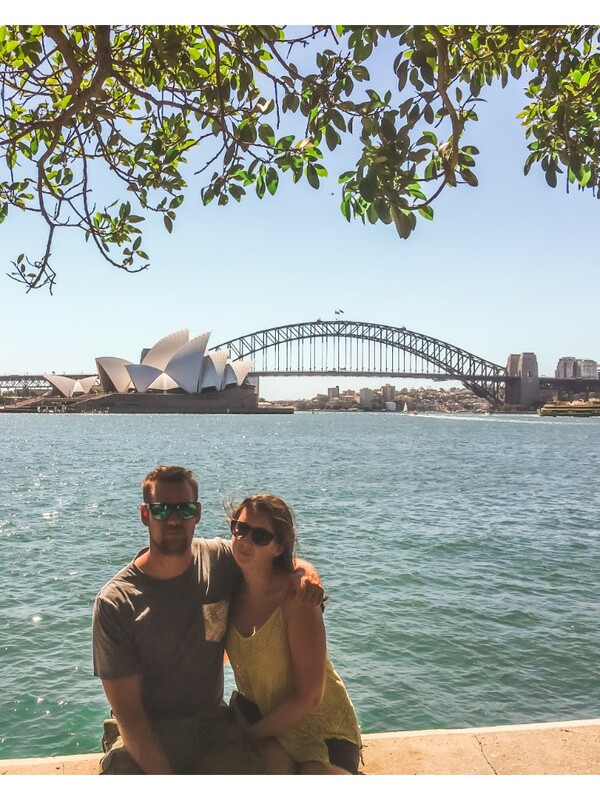 Check out our outback packing list!! One for the history buffs here. Learn more about the heritage of Richmond and the surrounding area’s over the past 150+ years at the Cambridge Downs Heritage Centre. This interactive display will help you step back in time to learn about Richmond in its early years. While we didn’t have the time to do the entire Dinosaur Trail, we thought we’d briefly touch upon it here so you can decide if you want to do the full triangle; honestly, we regret not making the time for it. Especially after learning about Winton’s dinosaur stampede! Don’t forget you can get cheaper access to all the attractions in all three towns here. Just a couple of hours south of Richmond is Winton, another small town well known for its fossil finds. What it’s most well known for though is the world’s only record of a dinosaur stampede. 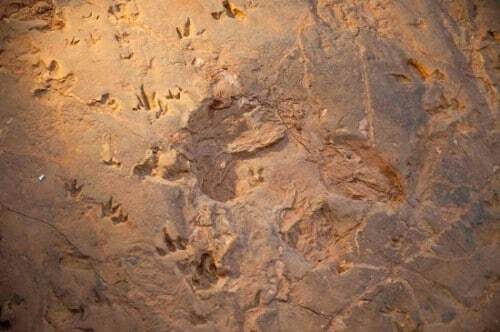 Preserved in the rock near Winton, thousands of dinosaur footprints have been found to show the rare occurrence where they all stampeded in the same direction. At the location you can see varying sizes of footprints and can only imagine what it was they were running away from. Mutt is Hughenden’s life-size model of a Muttaburrasaurus, he’s adorable and just undergone a much-needed makeover to ensure he stays looking smart for visitors in years to come. You can see the real Mutt at the Flinders Discovery Centre where ‘hughie’, Mutt’s real counterpart. At 7 meters tall her towers over guests and gives you another insight into what life was like in outback Australia millions of years ago. The Flinders Discover Centre also has heaps of other fossils and findings from across the area. Mutt – the model version of Hughie, found in Hughenden museum. It was hard to imagine outback Queensland completely submerged underwater, but after seeing Penny and her other prehistoric pals, it makes sense to why the outback is the way it is; Uluru, Kata Tjuta, The Devils Marble and Kings Canyon is so vastly different to the flatness everywhere else, it just made sense that the outback hasn’t always been so arid and dry. In fact, some of the research displayed at the Kronosaurus Korner show how the worlds oldest rainforest; Daintree, actually spread to the outer edges of this inland sea. So those tree’s you see today in Cape Tribulation will have seen some form of prehistoric creature at some point in their lifetime and that to me is mind-blowing. Do you enjoy visits like this? 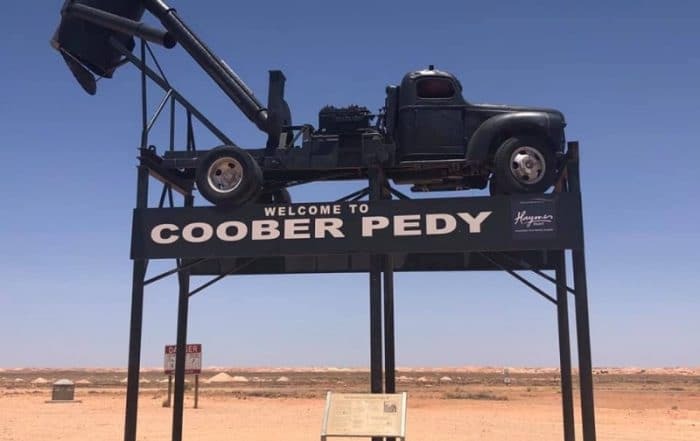 Finding a museum of this nature in the middle of the outback is definitely a day to remember. 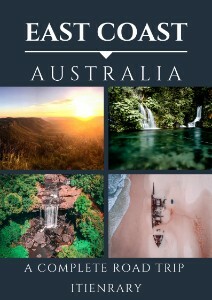 Let us know in the comment if you’ve been, or if you’d make a special trip when you’re in Far North Queensland!